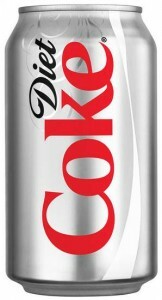 Do you drink Diet Coke? I do. Tons, actually. And I have decided that I do not like this about myself. I have also given up Diet Coke when pregnant. Each time I get away from it for a while, I am amazed by the fact that the first sip of the stuff I take after months of being “clean” tastes like … a horrifying mouthful of chemicals. And yet back I go. I’m not worried about caffeine. In reasonable doses, caffeine is my friend, and you will not convince me otherwise. I will continue to drink caffeine in coffee, but I plan to give up the Diet Coke. I am mostly concerned about the other stuff in Diet Coke — heroine, maybe? — that keeps me coming back to it. Something about the stuff convinces me that I need it. And not Diet Pepsi or that horrible store-brand cola stuff, I need Diet Coke. That’s just not a good thing. I don’t like to feel like decisions about what I put into my body are being made by anyone other than me. Besides, there are plenty of people out there who will tell me the health risks of drinking diet soda and even thoughtfully reflect on the reasons why diet drinks are an abuse of your body and an unhealthy approach to physical fitness. So I figure there’s no time like the summer for kicking the can and drinking water instead. We have an unlimited supply of water from our artesian well and it flows freely from the tap. I have a friend who recently had that surgery that makes your stomach the size of a walnut. One of the post surgery guidelines is that she is NEVER allowed to drink any soda for the rest of her life. No joke. She said the carbonation stretches out your stomach. Perhaps this is why most of America is overweight – carbonated drinks have stretched our stomachs, making it take us longer to feel full! I’ve been trying to get to my goal weight for months, and I occasionally go on DC-free spurts. Nothing has helped me steer clear of soda more than the thought of my stomach stretching out with each sip! Call it vanity, but it has kept the temptation under control! “. . . it is a common misconception that carbonation pulls calcium from your bones. . . It’s actually the phosphoric acid that many sodas contain, and possibly the caffeine, which have consequences for the calcium levels in the body. In general, only dark cola drinks contain both phosphoric acid and caffeine, while the iridescent green ones have just caffeine, and the clear citrus sodas and seltzers include neither. You should put all the money you save in some kind of fun fund. IMO, it will be easier to kick the habit if you have some tangible reward to look forward to. I have to treat diet cola like an recovering alcoholic treats alcohol. I can’t have a drop. I was drinking almost 2 liters a day. Caffein-free diet Coke or Pepsi. I don’t know what makes the darn thing so addicting but it sure is. I gave it up when I got pregnant. Then after losing the baby, I never started back. Now I drink tons of water. Occasionally I’ll drink a homemade smoothie or a smoothie I get from the gym. All fruit/juice with protein powder thrown in. Sometimes with non-fat vanilla yogurt. I’m not thin. I’m just trying to get thin. (smile). Good luck, Danielle. It’s not easy. Lord knows I couldn’t give it up until I got pregnant. It’s better without the stuff. Why not try Sr.Pat’s novena ? I know “it’s only soda” but it has become a problem and an addiction for you. It might take awhile BUT you will be happy with the end results. I used to work for the Coke company many years ago. I am not using my real name for obvious reasons. To begin with, diet drinks are more harmful to you than regular softdrinks. People seem to think that because it is “diet” it is less harmful, not true. The reverse is what occurs. Diet drinks do far more harm to your system than regular softdrinks. as for diet coke itself. Yes, it is highly addictive although the company would never admit it. It is not that any addictive item has been placed in the drink. It is the way the drink is made that makes it addictive. First off, it is literally saturated in caffine and the syrup that is used to make it is like molasses, literally. these two conditions plus the high content odf sugar or artificial sugar makes this product very highly addictive. If you as a person like softdrinks, you should try sasparilla. It is good for you and it is not addictive plus it tastes wonderful. What you may ask is sasparilla. It is Root Beer. I drink this myself and you know, I can take it or leave it. some days I have one or two and then I can go for days without it. I can not stand the taste of DC, so it is not a problem for me. I don’t drink any carbonated drinks, just unsweet iced tea, which I brew myself, and enjoy very cold and also with lemon, but it isn’t required. My friend, who has been drinking DC for years, has recently decided that this is the cause of her weight gain and not being able to lose. She has never liked to drink water her entire life, but now is adding the Crystal Light flavors that are for one bottle of water. I have not tried any of these, but she seems to enjoy it very much. Good luck, Danielle, with kicking your DC habit. I stopped buying DC some time back but always drank it when out to eat – especially at McD – free refills. Recently I got hooked though on McD’s Sweet Tea – $1.00 for a large in an insulated cup – great for those hot ball games. But now all my kids want one too. Why did I even let them taste it??! There was a lady on TV last night who had to have all her teeth removed in her mid 30s from constantly drinking lots and lots of Diet Coke – I think it was due to the sugar content – so good luck with the giving up! Every time you think about having a Diet Coke, think about having to take your dentures out every night before going to bed! I have to tell you that aren’t alone — but we can already see that from the practically billions of replies you’ve received. Many years ago I had a friend who was a Third Order Secular Franciscan. Her addiction was Pepsi and she absolutely HAD to have it. On camping trips one would think that cans of liquid might be a bit heavy to cart along. Nope. Not only did she take them in her back pack but she stood one up right beside her sleeping bag at night. First thing in the morning it was down the hatch with the Pepsi! Oh…ugh! Try the mandarin orange seltzer!! SPARKLING WATER. It will heal your DC Blues (literally [I’m pretty sure that’s the correct usage of “literally” :)]) I just posted on Rachel’s blog that my personal favorite, and who can argue this, is Pellegrino. But budget’s tend to not allow this one on a regular basis. La Croix is a wonderful, cheaper substitute, especially the lime one, and Poland Springs is cheaper still (but not quite as good). A great way to pep up your water and make it delicious and not so blah! Thanks for the post. I had decided to post this before finding yours. Are you back on Diet Coke?